I = I0(1– e– Rt /L) where I0 is the final steady current. The current I is therefore zero when t = 0 so that the the potential difference across the 8 Ω resistor R2 immediately after closing the switch S is zero. V = V0(1– e–t/RC) where V0 is the final steady voltage across the capacitor and R is the resistance in series with the capacitor. V0 = [12 V/(8+8) Ω] ×8 Ω = 6 V.
(c) After reaching steady state in case (b), the potential difference across the resistor R2 will be zero since the capacitor will be fully charged and there will be no charging current through R2 to produce a voltage drop across it. (d) The current through R2 will rise to the final steady value abruptly if a resistor is used instead of the capacitor mentioned in (b). The current through R2 immediately after closing the switch S is therefore equal to the current resulting from the division of the main current i1. Now, i1 = 12 V/(8+6) Ω = 6/7 A. [The 6 Ω resistance substituted above is the parallel combined value of R3 = 8 Ω and (R2 + 16 Ω) = 24 Ω]. The above current gets divided between R3 and the (R2 + 16 Ω) branch. The current through R2 and 16 Ω = Main current×(Resistance of the other branch/Total resistance) = (6/7)×[8/(24+8)] = (3/14) A. (e) As the potential difference across the capacitor is given by V = V0(1– e–t/RC) where V0 = 6 volts, the potential difference across the resistor R2 is V0 – V0(1– e–t/RC) = V0 e–t/RC. The nature of variation of the potential difference across R2 in this case (b) is as shown by curve (b). When a 16 Ω resistor is used in place of the capacitor, the final current through R2 is (3/14) A as already shown. The potential difference across R2 in this case is (3/14)×8 volts = 1.7 volt, nearly. 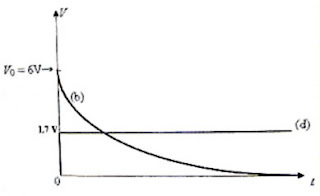 As the current through R2 will rise abruptly from zero, the potential difference across R2 will rise abruptly to 1.7 volt as shown by curve (d). (2) In the above circuit, suppose the switch S was closed for sufficiently long time so that steady state was reached. In this steady state the.switch S is opened at time t = 0. (a) On opening the switch S, the inductor will try to maintain the current flowing in it because of its inductance (electrical inertia). Therefore, the direction of i2 will be unchanged. But the direction of i3 will be reversed since the current now flows because of the voltage induced in the inductance. (b) Under steady state, the battery delivers a current of 1 A through R1 since the total resistance across the battery is 8+4 = 12 Ω. [Here 4 Ω is the parallel combined value of R2 and R3]. The potential difference across R2 (and R3) is therefore 4V. 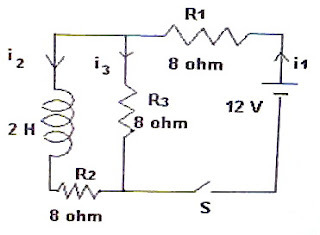 The current in the inductance branch cannot change immediately on opening the switch S so that the potential drop across R2 will be 4 volt itself immediately after opening the switch S.
I = I0 e– R t /L where R = R2+R3 = 8+8 =16 Ω (which is the total resistance in series with L, on opening the switch S). H = 0 ∫∞ 2e– 16 t = 0.125 joule. P = I2R2 = 0.52×8 = 2 watt. Note: Even if your theoretical steps, substitutions and calculations are correct, you will lose points if proper units are not supplied. This is especially important in questions involving numerical values. Work out as many questions as possible to make you strong in facing the AP Physics Exam.